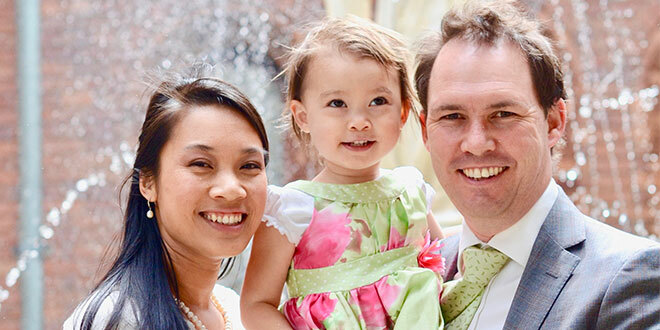 Family connect: Sidney Rofe with his wife Tien and daughter Elisabeth, 2. “CONNECTION” is an ideal architect Sidney Rofe aims for professionally and personally. His mother Mary Rofe, however, remembers “a very quiet boy” who largely preferred his own company. Born in Maryborough, the eldest of eight, Sidney “was happiest with blocks … paper and something to draw with”, she said. The family lived in Townsville and later, Rockhampton, immersed and well versed in Catholic tradition. Sidney’s maternal grandfather ran a Catholic bookstore, and “serial cups of tea” were shared as faith was discussed, his father John Rofe often a jovial part of discussions. Accustomed to robust conversations, the now 44-year-old architect landed at a state high school on Brisbane’s northside, where his artistic endeavours were well supported. “I liked sculpture and pottery and took tech drawing,” Sidney said. What he described as a student who was “a Bible-bashing Protestant” set Sidney on an interesting path. “(The person said), ‘All you Catholics are idol worshippers’ and I had no way of defending that,” he said. In his seeking, Sidney said he discovered his faith “was quite benign”. “What I found was there wasn’t really anything to help me discover why we did things a certain way,” he said. Sidney said when he began an Arts degree at the University of Queensland (UQ) “the anti-Christian pressures got worse”. Baptised in Corpus Christi Church, Nundah, because of Mary’s family’s connection to the parish, the Rofes found themselves re-acquainted with Mass-going there and Sidney, a gifted singer, was part of the church choir. Still, during this time of active faith and soul-searching, he admitted to “going to Mass but not feeling an emotional connection”. “I didn’t understand why people went to Mass and were satisfied with that; I didn’t get the spiritual connection,” he said. Various youth groups like Antioch and Emmanuel (then Covenant) Community, weren’t his “fit” either. As a result, at 19 and before officially commencing architectural studies, Sidney self-launched a research project concerning liturgical realities and church environments, allowing a greater understanding of the Second Vatican Council. The “bottom line” was he was seeking “a more reverent Mass”. Enrolling in architecture at Queensland University of Technology, involvement in the St Thomas More Centre youth group heralded an interest in deeper faith expression and understanding. “I went to the first Thomas More Winter School,” Sidney said of the mid-’90s opportunity. “Their objective was to improve people’s understanding of faith but also to give them an intellectual understanding. In the late ’90s, Sidney developed a love and understanding for Gregorian chant. “Vatican II documents say that parts of the Mass should be said and sung by the people in Latin, and I thought, ‘Wow’ and started to discover Gregorian chant and how we can incorporate it into the Mass”. The exuberant Catholic found himself part of the St Cecilia’s Schola, Brisbane and, while he wasn’t a Latin Mass-going Catholic at the time, the group allowed a deeper appreciation for the traditions of the faith. The schola sang at Sunday Mass at Our Lady of Victories, Bowen Hills, Sidney saying it “satisfied” him but he “wasn’t happy”. Congruently, he was spending more time among the Latin Mass community of Lewisham, Sydney, often invited to participate in their liturgies because of his interest and knowledge of Gregorian chant. “If you really want to be moved, go along to full liturgical ceremonies like at Lewisham at Easter and, goodness, it blows your mind,” he said. “There’s candles, half the Mass is in darkness, we sing the Exsultet and it lights up. “All that ancient music, and in that space, that was emotional for me. Faith grew through a greater understanding of and appreciation for architecture, leading to his timely thesis on “The Theology of Church Architecture: A critique of Contemporary Design in the Catholic Church”. All the while, Sidney “didn’t live in Lewisham but had a spiritual connection there”. It’s where he met Tien, and they married in 2014 “with five priests and all the bells and whistles”, Mary Rofe interjected. The couple welcomed daughter Elisabeth the following year. Today, the younger Rofes work collaboratively in Sidney’s architectural firm, interestingly based in the city of the same name, are active members of the Latin Mass community in Lewisham, and often travel to Brisbane and beyond to be among family and friends and for work purposes. While Sidney works on private projects, he’s carved a niche for his faith-led talent, involved in a number of ecclesiastical projects for the design or renovation of cathedrals, churches, chapels and a retreat centre. In Brisbane, his designs will feature in the new Banyo Nundah Parish Centre, with construction to begin this year. “You go to architecture school and you have to think of new ideas and be innovative, with the whole impetus being original and creative,” Sidney said. “But that was a conundrum for me as it was going against the Church and its tradition. Overseas he was “interested in the way people live in older towns and cities”. “In an Italian village, you see shops, the town hall, church and people living within 10 minutes’ walk,” Sidney said. Sidney strives for three main objectives in his work – beauty, durability and usefulness, with a sense of “a transcendental experience” no matter the work’s nature. When designing for a spiritual space, he’s conscious of “increasing the sense of the sacred and of community … (and) there must be a sense God is real and God is present”. “We’re a pioneering culture and as I move along in my architectural career, the whole legacy of what I studied, and through jobs I am getting in the Church, what’s become apparent is we have to find ways of building community,” he said. Sidney said modern life made it difficult for such connection but it was invaluable that authenticity was met with “seeing each other every day” because “that’s the way we live Christian virtues”. “You can help the mother having trouble with a child, you can be genuinely charitable to people because you’re not thrusting yourself on them, you already have a connection,” he said. Sidney’s perspective lends itself to the need to realise and nurture “a context to be better people to each other”. “This is important from a Church point of view because we need to evangelise … the official term is an ‘intentional community’.